Celebrate National Volunteer Month with Chuck E. Cheese's & Big Brothers Big Sisters! 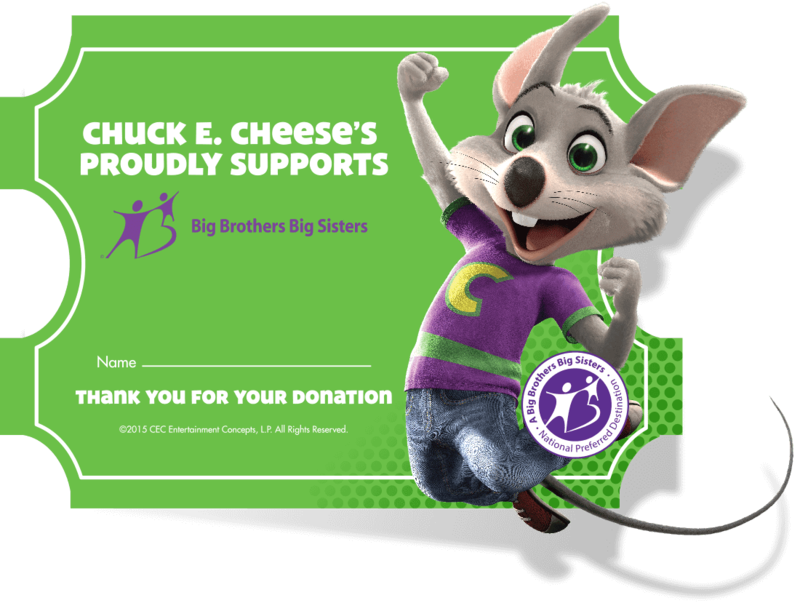 HomeCelebrate National Volunteer Month with Chuck E. Cheese's & Big Brothers Big Sisters! We love going to Chuck E. Cheese's! Lydia loves this place and my husband and I have a great time when we go as well! Chuck E. Cheese's in our town is always nice to go to and we even had Lydia's 9th Birthday party there! Did you know that April is National Volunteer Month? 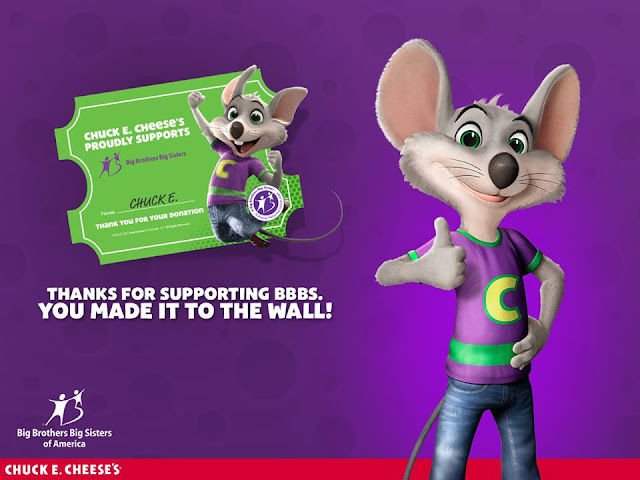 Chuck E. Cheese's is celebrating with a nationwide donation drive for Big Brothers Big Sisters, where families can donate $1, $5 or any amount of their choice to help BBBS match “Littles” with “Big” mentors! When kids donate, they get to write their name on a Pin-Up ticket and stick it on the wall to show their support! Check it out below! I personally think that this is a great way to teach your child to give back and they can have fun while doing it. Chuck E. Cheese's has so many locations, all it takes is visiting their website to see where there is one near you! I am encouraging YOU! My readers to make a difference and set an example for our children. Take them into a location today and donate! Even if you just donate $1, it helps! Did you also know that if you join Chuck E-Club, you can get tokens, rewards, exclusive offers, & discounts? 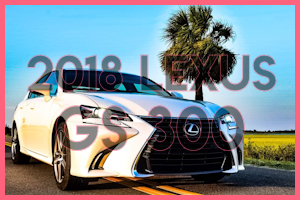 Visit their website for more info! 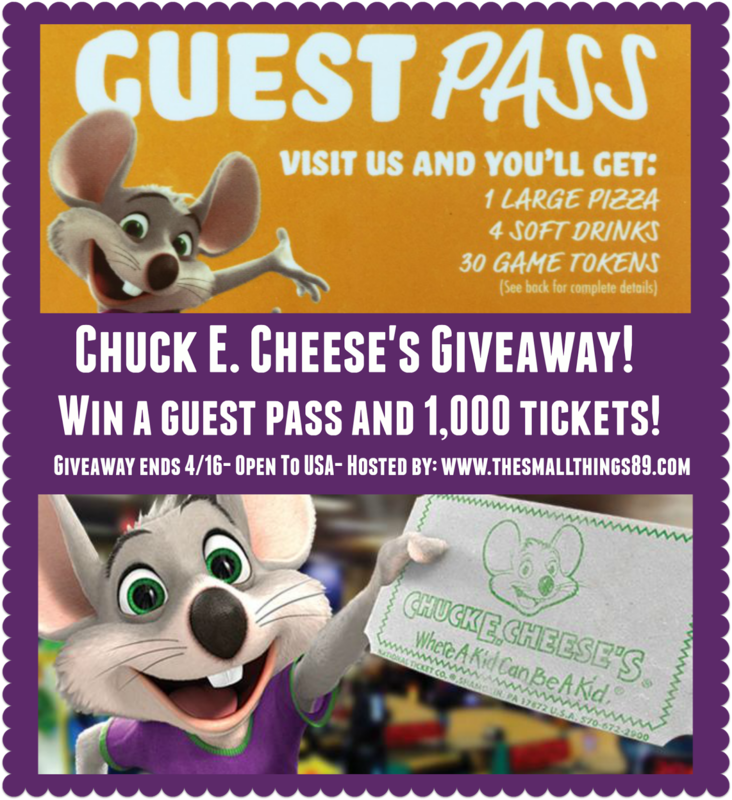 Win it: To celebrate National Volunteer Month, Chuck E. Cheese's is sponsoring a giveaway for one lucky reader to win (1) guest pass and 1,000 tickets! One pass is good for a large pizza, 4 drinks + 30 tokens! So much fun for the family! All that I ask is that you show your ongoing support by donating to Big Brothers Big Sisters at any Chuck E. Cheese's location 3/31/16-4/30/16 to help match Littles with Bigs and provide lifelong mentorship for positive change. Giveaway is open until 4/16/16. Giveaway is open to the USA. 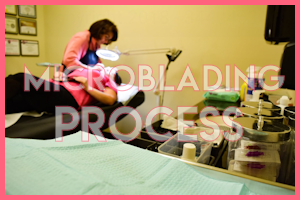 Make sure you have a location near you before entering. Enter below. Goodluck! The Small Things is not responsible for prize shipment. The Small Things received two guest passes and 1,000 tickets in return for this post. I do and we love Chuck E. Cheese!!! I love Chuck e Cheese! Yes, I will for sure pay it forward! I love that these two are teaming up to help the kids! We will be visiting during volunteer month! We love going to Chuck E Cheese! I love that they have a gluten free pizza for me, so I can eat too! A fun place to go! I do plan to pay some of it forwards if I win. And I also love chuck e cheese. My kids have been bugging me to go. I already pay it forward!! and who doesn't love Chuck E CHEESE?? I love this and do plan to pay it forward...my sons absolutely love Chuck E Cheese! My kids love going to chuck e cheese. 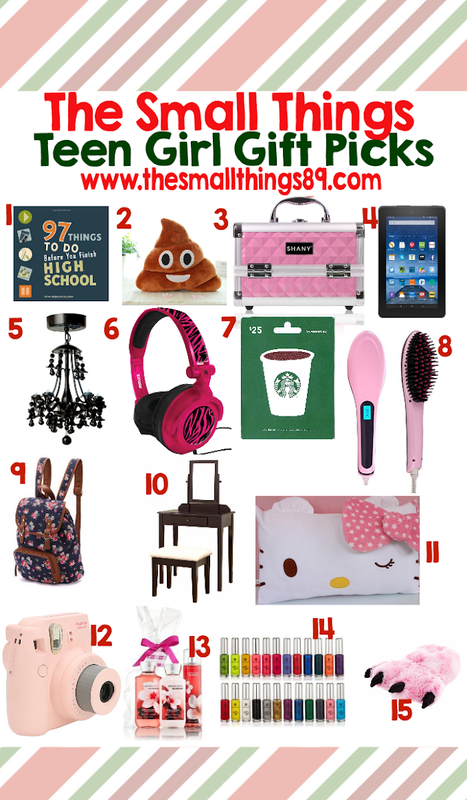 I always try to pay it forward sometimes with monetary donations and sometimes with my time or gently used items. I do love chuck e cheese. If i win, I will pay it forward by donating to the homeless shelter. Yes! 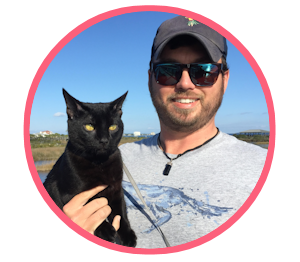 I believe in paying it forward and giving when able. We also love Chuck E Cheese so the kids can get their energy out when the weather is not good. Yes I do plan to pay it forward. We love Chuck E Cheese and go a few times a year. I would pay it forward! We would pay it forward and we LOVE chuck E Cheese. We like Chuck e Cheese! Yes, I will pay it forward. My grandkids love Chuck E Cheese and one of them (if not all) would love to have a birthday party there in Spokane, WA.